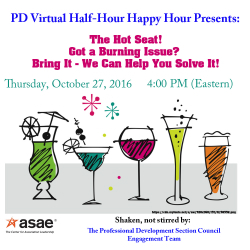 PD Virtual Half-Hour Happy Hour - Got a burning issue??? Bring it! We will help solve it! The Professional Development Section Council invites you to the 2nd Virtual Happy Hour! Topic: Hot Seat Program "Got a Burning Issue? Bring it - we can help you solve it!" Bring your issues and grab your favorite beverage! Hope to see you then (virtually that is)!